My housemate made this soup for me several months ago, and I immediately fell in love. She now makes it every so often, and each time, I can't get over its shear goodness. Lentils, beans, egg noodles, cilantro, and sour cream in broth. What more could you want?! It is perfect for cool nights and is great freshly made and as leftovers. This recipe is taken from 101 Cookbooks. Heat the oil in a large, thick-bottomed soup pot over medium heat. Add the onion and the chile and cook until they soften, a few minutes. Add the spices and cook for another thirty seconds, just long enough for them to toast a bit, then stir in the stock. Bring to a boil and add the split peas/lentils to the pot. Cook until they are just tender, about 25 minutes. 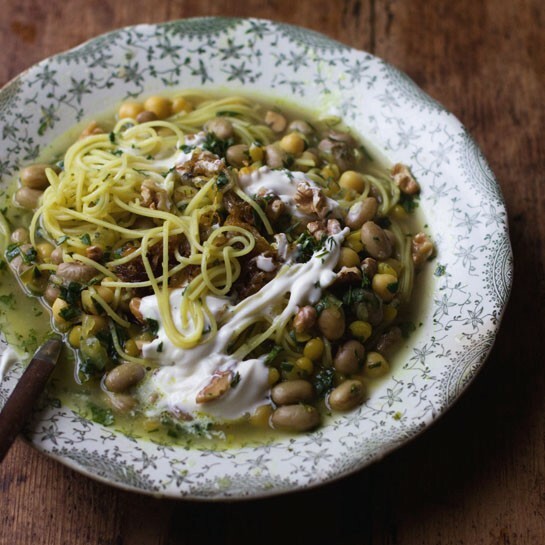 Stir in the cooked chickpeas and borlotti beans. Once the beans have heated throughout, season with salt to taste. In the meantime, you can prepare the toppings. Heat the olive oil and butter in a large frying pan over medium heat along with a couple big pinches of salt. Cook the onion, stirring occasionally, until golden and caramelized, 8 - 10+ minutes. Set aside. Just before you're ready to eat, add the noodles to the simmering soup and cook until al dente. Stir in the spinach, and cilantro and dill. Add a big squeeze of lime to the pot or serve wedges along with each bowl of soup. Taste and adjust the seasoning to your liking. Serve right away, each bowl topped with a big spoonful of caramelized onions, some creme fraiche, and a sprinkling of walnuts.